...................... named outfile_kneegraph.gif rather than just viewed. PURPOSE: To create a symmetric soft knee-shaped curved mapping look up table and applies it to an image. DESCRIPTION: KNEEMAP creates a symmetric soft knee-shaped curved mapping transformation similar to -evaluate log or -evaluate pow (-gamma), but which is symmetric. This transformation is generated as 1D lut and applied to the image using -clut to affect the intensity/color transformation. The transformation is sensitive to the desired channels specified. -a amount ... AMOUNT is the amount of curvature for knee curve mapping transformation. Values are in the range 1<float<1. Positive values non-linearly brighten the image and negative values non-linearly darken the image. The default=0 for no change. -g ... enables the creation of a graph of the knee curve mapping transformation, which is then displayed automatically. There is a default setting below that can be changed to enable this to be save to a file named outfile_kneegraph.gif. The graph will be scaled to size 100x100. 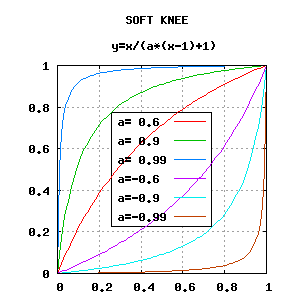 Knee Map is symmetric and uses values between -1 and 1 with 0 as no change. 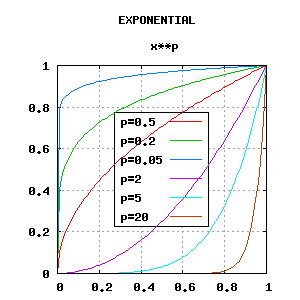 Exponential Map is not symmetric and values range from 0 to 1 and 1 to infinity with 1 as no change. 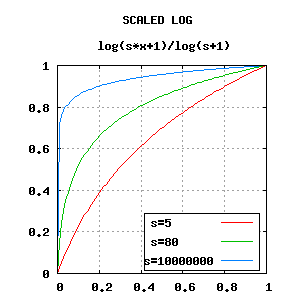 Scaled Logarithmic Map is not symmetric and one-sided with values ranging from 0 to infinity. A no change value does not exist. This is equivalent to the following IM commands. convert -quiet -regard-warnings "$infile" +repage "$tmpI1"